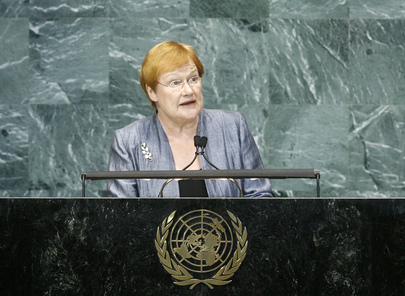 TARJA HALONEN, President of Finland, said that climate issues and the recent financial, economic and food crises called for a change, and that growth needed to be green, equitable and inclusive. “The current consumption and production patterns need to be revised in many countries,” she said. “In the words of Mahatma Gandhi, there is enough in the world for everyone’s need, but there cannot be enough for everybody’s greed.” She underlined the need to deliver on commitments to the Millennium Development Goals. Biodiversity was vital for sustaining ecosystems and mitigating climate change, and the Assembly high-level meeting on biodiversity was a good step forward, she said, as was the current two-day session on the special needs and vulnerabilities of the small island developing States and the implementation of the Mauritius Strategy. She expressed Finland’s commitment to a new ambitious climate agreement, and noted that the United Nations had to promote a new blueprint for low-carbon prosperity. Human rights must be enjoyed by everyone without discrimination, she said, stating Finland’s support for the International Criminal Court’s work in bringing to justice those responsible for the most serious crimes, she said. Because solutions to global challenges could not be found without women’s active participation in decision-making levels, Finland also strongly supported UN Women and had started an initiative with Kenya concerning Security Council resolution 1325 (2000) on women, peace, and security. Finland supported the development of the United Nations’ peace mediation activities and, following direct talks that have begun in the Middle East, stood ready to give support wherever needed. Finland was also greatly encouraged by the new START agreement between the United States and the Russian Federation, as well as the outcomes of the Nuclear Security Summit in Washington and the Review Conference of the Nuclear Non-Proliferation Treaty, maintaining that global and bilateral efforts had to be continued towards a world without nuclear weapons.